RETA has conducted significant research on burying high voltage power lines. We have studied the literature on the matter, and have met with underground cable experts from around the world. Several underground cable experts from Europacable have attended public and private meetings organized by RETA. We arranged for underground cable experts to meet with the Alberta Minister of Energy, other Alberta Members of the Legislative Assembly, as well as Alberta Energy staff, to explain how the undergrounding technology has advanced in recent years and how the costs have come down. Unfortunately, the Alberta Government, Alberta Electric System Operator (AESO) and Alberta Utilities Commission (AUC) refuse to seriously consider burying high voltage power lines like more progressive jurisdictions around the world do. RETA has prepared a Fact Sheet on burying high voltage power lines, and references on the subject are included in our comprehensive reference list. can be buried for almost the same capital cost as overhead lines. The capital cost of burying these lines is not 4 to 20 times the cost of building overhead lines, as suggested by the Alberta Electric System Operator (AESO), Alberta Energy and transmission facility owners in Alberta (e.g., AltaLink, ATCO Electric, EPCOR). For example, expert testimony at the April and May 2011 Heartland AUC hearing indicates that the capital cost of a partially buried Heartland double circuit 500 kilovolt line (i.e., 20 of 66 kilometres would be buried) is only about 15% higher than AltaLink’s and EPCOR’s $580 million estimated cost of an entirely above-ground Heartland line. This is a rounding error within the electricity transmission industry, and well within AltaLink’s and EPCOR’s Heartland Transmission Project contingency budget. Maintenance costs of buried high voltage power lines are substantially lower than for overhead lines, and this is because underground lines are not subject to tornadoes and other high wind storms, ice storms, general weather deterioration, birds colliding with lines and knocking the power out, etc. For example, the 40-kilometre 500kV line buried in Tokyo in 2000 has had zero maintenance issues. Transmission loss (electricity to heat) costs are anywhere from 50% to 67% lower for buried than for overhead lines. This can add up substantially over the 60-year life of a line. In Alberta, the one-year transmission loss costs were estimated by AESO at $220 million in 2009. When you combine the capital, maintenance and transmission loss costs over the 60-year life of a high voltage power line, and add the health and property devaluation costs associated with overhead lines, buried lines cost much less than overhead lines. So don’t believe any transmission company that says it’s too expensive to bury high voltage power lines. When asked about burying high voltage power lines, many electricity transmission companies will respond, “It hasn’t been done before” or “The technology hasn’t been sufficiently developed” or “You can’t successfully bury higher voltage transmission lines such as 500 kilovolt or 400 kilovolt lines”. None of these responses is true. The fact is there are thousands of examples of successfully buried 240 kilovolt transmission lines and lines of lower voltage. Many cities and towns around the world have many miles and kilometres of buried high voltage lines, especially in densely populated and “downtown” areas. As transmission companies look to build higher voltage lines – 500kV and 400kV – more and more residents, businesses and governments are calling for these lines to be buried because the higher voltage towers and lines are usually much taller and more unsightly, and hence have increased negative impacts. 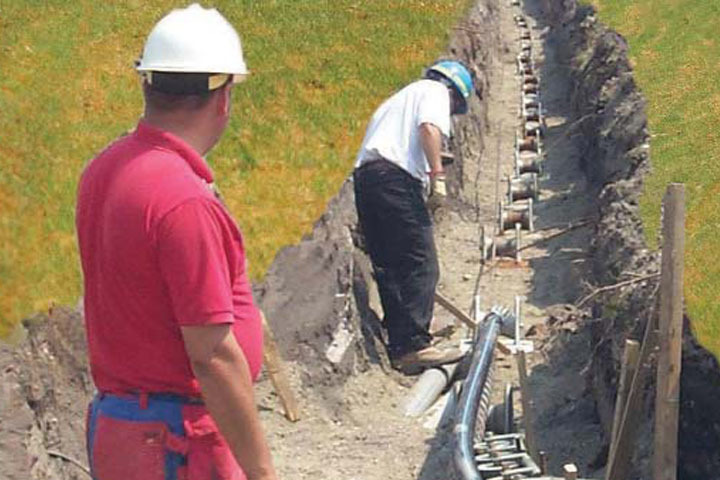 There are many examples of successfully buried 500kV and 400kV lines. This list includes just a few of the many successfully buried 500kV lines, and this list includes just a few of the many successfully buried 400kV lines. For technical details of another successfully buried 40-kilometre-long 500kV line in Tokyo see Yonemoto et al. 2003. When the capital, maintenance and transmission loss costs are combined over the 60-year life of a line, underground high voltage lines are generally less expensive than overhead lines. High Voltage Direct Current (HVDC) lines are even easier and cheaper to bury than High Voltage Alternating Current (HVAC) lines. We bury sewer lines, water lines, telephone lines, electricity distribution lines, TV cable, natural gas lines, oil pipelines, gas pipelines, and other petroleum product pipelines. It’s time we started burying more high voltage transmission lines (AC and DC) because overhead lines and towers are unsightly and have so many other negative impacts.